Hey folks, my name’s Mark Ottobre, and in this video I’m going to show you why diets really fail. Before we get into it, make sure you subscribe to our channel and ring the bell for further updates. Why do diets really fail? Obviously there are a lot of diets that people like to make fun of, whether it be clean eating, Paleo, Atkins, hell, whatever. I’ve been labeled a clean eater many times because I like eating good, wholesome foods. But really, why do diets really fail? Well I think large in part, it’s the psychology that goes behind the diet, not the actual diet itself. Because if we look at anything, if we look at evidence for anything, any diet can really work. Whether you are calorie counting, counting macros, or eating clean and eating wholesome, natural foods, and restricting your options, those diets can work because people have gotten results on those. What is behind this? Why do some people succeed, where others actually fail on the same thing? And when the roles are switched and people try other diets, that’s when they succeed. What is it? It’s the psychology behind diets. Behind me on this board, I’ve got what I call, from my friend Duane Ally, I’ve got the Pyramid of Change. At the top of the pyramid you have your identity, then you have your beliefs and values, then your skills and skillsets, then your behaviors and environment. Before we delve into the details, keep in mind that change will always trickle down. That means that your identity of who you are in this world and you how you see yourself, will influence your environment. It will certainly influence your behaviors, it will certainly influence your skills and skillsets, and it’s certainly gonna influence your beliefs and values. Say for example, if you identify yourself as a healthy person, if you say, “I’m a healthy person who eats healthy foods that build and nourish my body,” a belief or value that you might have would be on training, on exercising. Whereas, if you identify yourself as lazy, you might say, “Well, that gym stuff is just for those buff guys and those Instagram models.” When really it stems from your identity of who you are in this world. Now, lets look at who you are, how you relate to yourself. It’s very, very important. What beliefs do you have about yourself? What do you believe to be true? Because a belief really is nothing more than something that you have chosen to believe is true, whether that’s Christianity, or any religion for that factor, or any idea, or politician, or whatever it may be, that’s an idea that you have chosen to be true. I like to relate beliefs to a tabletop. When you look at a table, you have a tabletop, that’s your beliefs. Now what people often do is they look for evidence of those beliefs, what evidence in their life can they support to that belief. And obviously, the more evidence you have, the more legs you have, the sturdier that table becomes, the more ingrained that belief becomes. For example, if you identify yourself as a fat person, or unhealthy, or just not able to get results, you’re gonna look for evidence to support that identity, and that ultimately is come belief, and it’s gonna become an ingrained pattern. Moving into skills and skillsets is the “how?” part. If you fundamentally believe that it’s not gonna work for you, well how hard are you gonna try to try and get the right information? How well are you gonna try and implement that information? The answer is not very, because you fundamentally believe it’s not gonna work for you, and there’s evidence in your life to support that. So what do you do? Well you gotta kick down those beliefs, you gotta kick down those legs, you gotta breakdown the evidence that you have and create new evidence that you can do it. The identity, and beliefs and values portion of this pyramid is the be portion of the pyramid. I’m gonna introduce another philosophy and that’s the be-do-have, this is the be portion, I suppose, getting results, the be-do-have formula for success. You may have seen this on YouTube or on past videos that I’ve done, but the be-do-how formula for success. This is the be portion, this here is the do portion of what you’re actually going to do, and finally your environment is the have, and that ultimately is your results. Change almost always flows down the Pyramid, not up! Let me break that down even further, because I know that I’ve just laid a whole bunch of new ideas on you at once. As I said at the start of this video, change will always flow down, but only sometimes flows up. That means that, we take environment for example, very seldomly do people get out of the prison system and become fully-engaged humans inside a “normal society.” No, what usually happens is people go into I’d say a prison, and their identity of being a criminal is reinforced. Now this is a moral judgment of do we need the prison system, and all this kind of stuff, it’s just to say that changing someone’s environment solely doesn’t always or necessarily lead to an identity change. Now, if we take for the example of Nelson Mandella, Nelson Mandella went into a prison, he came out a world leader. He had an identity change, he is a very rare exception. Most people have that identity reinforced, and again, this isn’t a pro or con against the prison system, it just is. So from our environment we have our behaviors, what behaviors, and skills, and ultimately our skills and skillsets influence our behaviors? 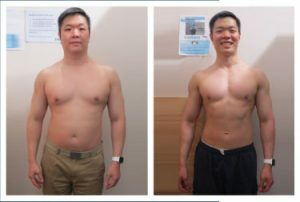 For example, if you’re wanting to get six-pack abs, and you know what behaviors to do, well those behaviors are ultimately gonna be influenced by the skills and skillsets that you have, because ultimately the skills and skillsets that you have may not be conducive to actually getting those results. So how does this relate to diet and nutrition? Yes, there are a portion of people who they just simply don’t get the right advice. It’s two camps, there are people who are getting the right advice, and they’re still failing because of their identity, and beliefs and values, and I find this a heck of a lot more common. But yes, there is a heap of people who are given the right advice, who have all the knowledge, who do all the right things, but they can’t implement it because the do aspect. The skills are there, but actually the way they implement it on a psychological level, they’re not implementing. Finally, we move up to the identity, and beliefs and values, which I just covered previously. Why diets really fail. Very, very simple, in my eyes is really two camps, either yes, let’s look at their physiological one, for starters. Physiological one is that you’re following the wrong diet. Yes, probably there’s millions of people who, and different diets, et cetera, that can help you get there, and obviously at Enterprise Fitness, if you subscribe to this channel, we’ve got heaps and heaps of great videos that are on this topic where you can get the right advice. But aside to that, the psychology. It’s looking at your identity, and your beliefs and values. Do you feel worthy? And that’s a very confronting question for a lot of people who’ve been struggling with weight loss their whole life, and been struggling with results their whole life. 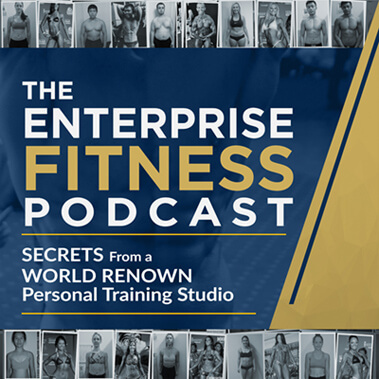 And one of the unique things about Enterprise is that when we get someone who is struggling like that, and they’re surrounded by champions at Enterprise Fitness, and champion trainers, that does something to their psychology. In the words of a friend, Dr. John D. Martini, “You can’t help put your hand into a pot of glue without some of that glue sticking.” And that’s what it’s like training at our studio is that just you’re surrounded by excellence constantly, and people lifting you up. So that has a great effect. And I know before that I said environment doesn’t necessarily change, but it certainly can influence and encourage you to stick on the course. And also it’s gonna influence your skillsets, but it can help you question your beliefs and values as to why did you believe it in the first place. You were just given the wrong diet, and often it’s just a matter of going through all the failures, and the evidence that you have of failures, and looking at it. Well was it really a failure? Probably not. I’ve said that for a very long time, and fundamentally, ultimately today, it’s become true because it’s the way I’ve spoken to myself, and I’ve looked at the world from an identity frame of I am a healthy person, who eats healthy foods, that build and nourish my body. That has then flowed on to my beliefs and values, and the way I eat, and skills and skillsets. Hope you’ve enjoyed this video. Thanks for watching. Remember to subscribe to Enterprise Fitness Melbourne YouTube channel, and make sure you ring that bell for all future updates of our great videos and great content. Until the next time guys, make sure you train hard, supplement smart, and eat well.